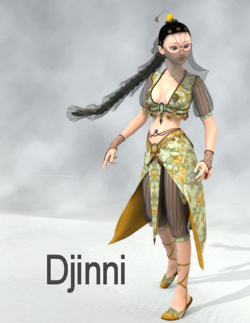 Djinni set for Aiko 3 is a character and wardrobe set for Aiko 3. The set changes Aiko into an Arabian-nights-style harem dancer. It includes hair, jewelry, gloves, shoes, and hat. This page was last edited on 2 August 2018, at 21:01.